Hard on the heels of TuneIn's announcement that it was adding audiobooks comes the news that the music streaming service Deezer is following suit. 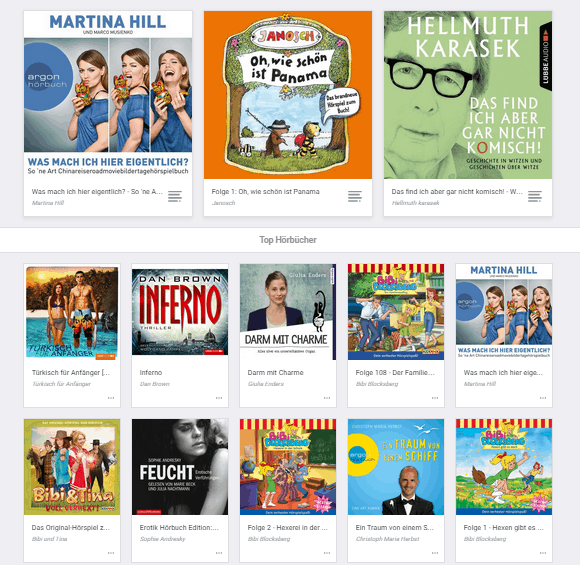 Deezer is not yet available in the US, but over in Germany BuchReport.de reports that Deezer has added "thousands" of German-language audiobooks. The Paris-based service boasts of having more than 6 million paying subscribers in more than 180 countries. They also claim to offer the largest music catalog in the world with 35 million songs and over 30,000 streaming radio stations (TuneIn claims to have 100,000 radio stations). And now Deezer is adding audiobooks, including both new releases like the latest work from Dan Brown and classics like Sherlock Holmes. The audiobooks can be heard in Deezer's apps for iOS and Android. Deezer offers both a free tier and a paid tier (10 euros) which promises better audio quality (320 kbps) and more features, including playing songs offline and skipping radio tracks. The free tier is subsidized by adverts inserted between tracks (and between audiobook chapters, probably). I’ve been a long term UK subscriber of Deezer and I can now see Audiobooks in my deezer app – in German. I’ve only looked for Dan Brown so far. I had found a couple of audiobooks before – old books on Old Testament characters as I recall.